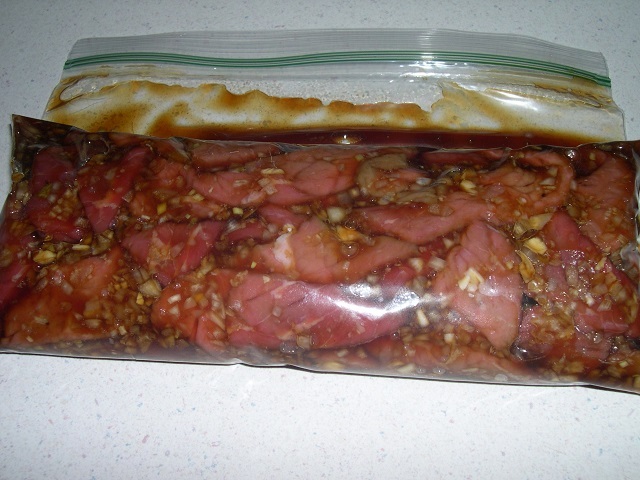 Here’s a nice BBQ beef recipe based on many internet sources. 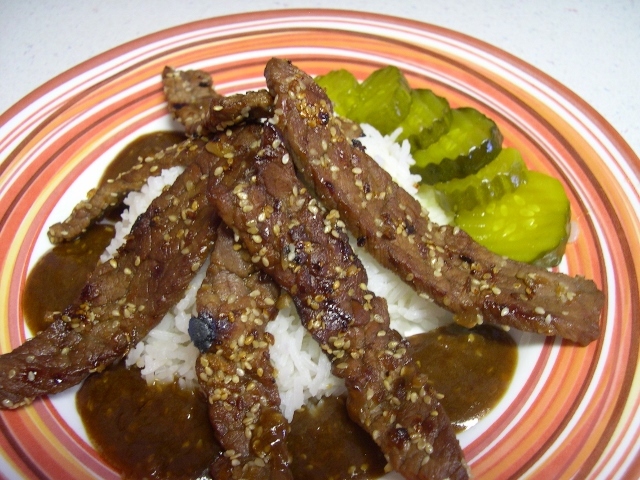 It can be made from almost any cut of beef that can be sliced thinly. Made with commonly found ingredients anyone can make this. 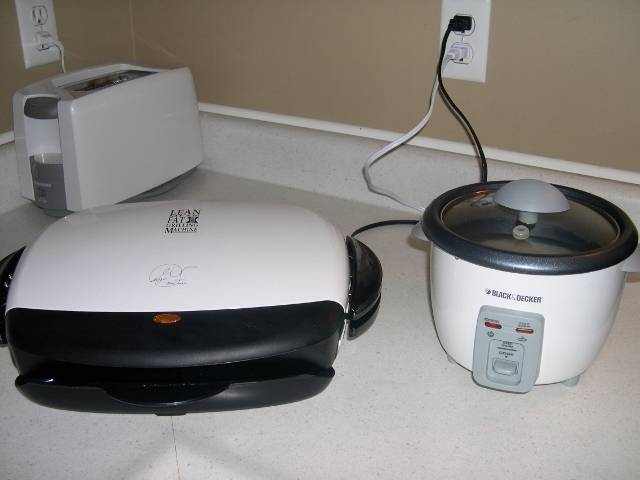 Normally threaded on sticks and quickly grilled over a very hot bed of coals, it can be enjoyed stir fried or as in my case cooked using this American kitchen gadget called a George Foreman grill. Served with rice and the ubiquitous Kimchi a fine Korean meal can be had. To a large bowl add the soy sauce, sherry, sugars, onion, garlic, ginger and kiwi. Stir it well to dissolve sugars. 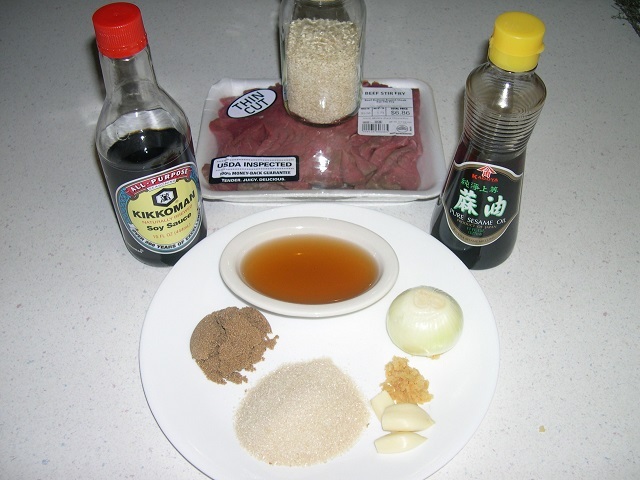 Add the beef and mix it well with your hands, making sure all the beef surfaces are coated with the marinade. Place this mixture in a gallon zip bag, squeeze out the air, seal it and put it in the fridge for 12 hours. Flip it and work it in the bag half way through the time in the refrigerator. You might be wondering about the 1/4 teaspoon of kiwi fruit. It is a very potent source of an enzyme called -Bromelain- Actinidin. (Sorry) This enzyme will tenderize the beef while it is in the refrigerator. After 12 hours make some plain rice, fire up the grill, or heat up the wok or warm up the GF Grill. Go! Go! Gadget! At the Franklin homestead. 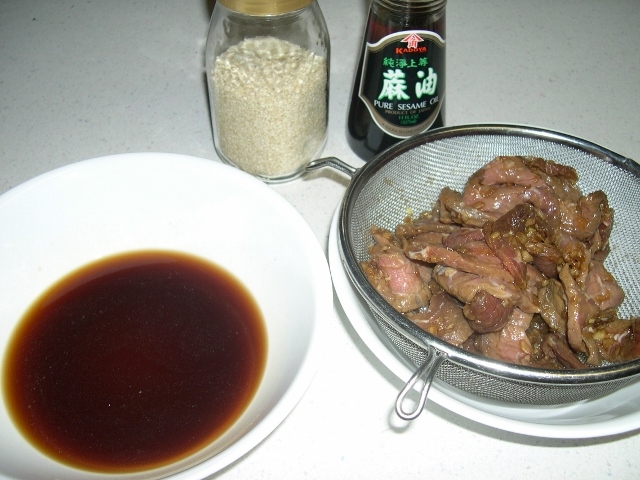 Remove the beef from the refrigerator and put it in a strainer to remove excess marinade if there is any. Put the beef in a bowl. 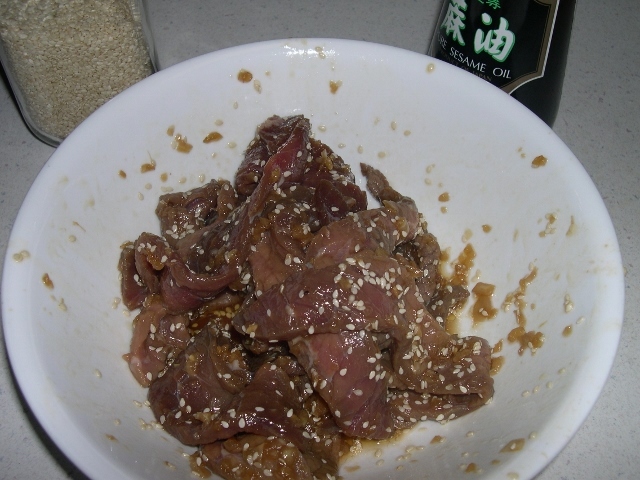 To the bowl add the sesame seeds and sesame oil and mix it well. Thread beef on skewers and grill quickly, or stir fry in a screaming hot wok for a just a few minutes or lay it out on the GF Grill and let it go for 4 minutes. Meanwhile take the strained marinade and reduce by 1/3. To the dregs of the bowl you transferred the strained beef to, add 1 teaspoon of cornstarch and mix it well. 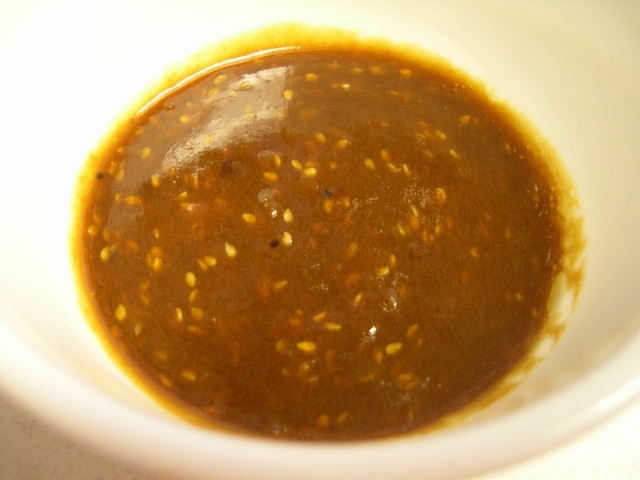 Then put this with the reduced marinade an boil gently for a few minutes to create a nice sauce. 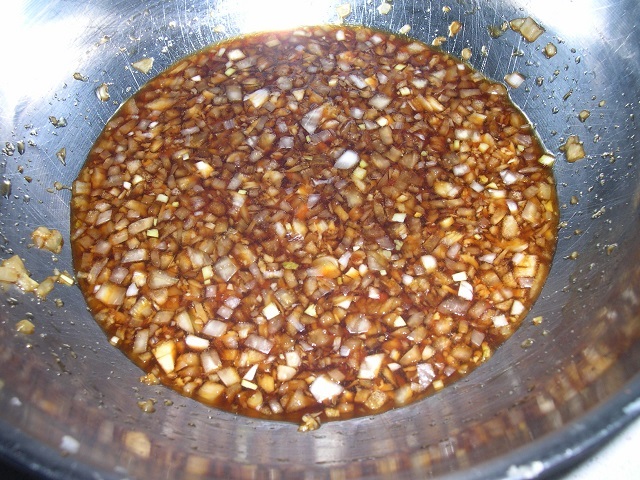 Add the drippings from the grill and mix those in too. Plate the beef with some plain white rice, a little sauce and some Kimchi if you have it. I had no Kimchi so I used some nice pickles. I've made this exact recipe at least 6 times, on the GF grill, wok and hibatchi, and it always satisfies. Just be mindful of the saltiness of the soy sauce you use. Using some types you might make this too salty to eat if you use the quantities given in this recipe. A great Korean pictorial, Rod - thanks for posting! It looks delicious, and judging by the ingredients' list, I am guessing that it tastes even better. 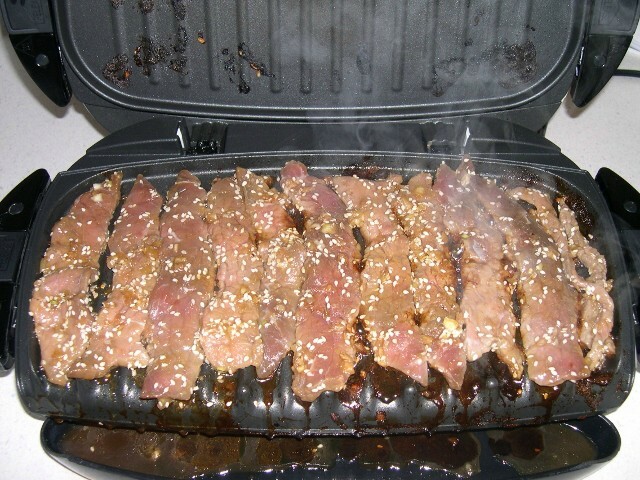 The restaurant at our local motor hotel, ironically, makes some of the best Bulgogi that I've ever tasted. A few years ago, a Korean family bought the place and our small, rural town benefitted greatly from the new menu. The Beautiful Mrs. Tas and I occasionally enjoy ordering the Bulgogi there, but I got to thinking that I could probably make it just as well, if I try Rod's recipe. All of the ingredients are easy enough for me to get, except one: the cream sherry. To my knowledge, there is no cream sherry available to me within my grocery shopping radius. My question is, is that going to be a very big deal, if I use something else? The only sherry I can really get my hands on is "cooking sherry," sold at grocery stores. Perhaps I can try that and add a little sugar to it...or, perhaps, the amount of sugar and brown sugar in the recipe is enough to make a good representation of the recipe. Another substitution that I've seen on the Internet is to use apple cider vinegar, but I have no idea if that would be a good idea; on the surface, it doesn't sound like it, but I could be wrong. If anyone with experience in this area has any advice, let me know.